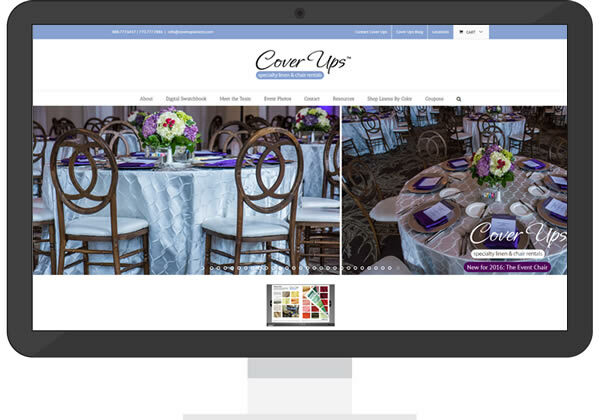 Cover Ups Linens offers an extensive collection of high quality specialty linens and chair cover rentals. We began working with the team in 2009 when they approached us to find a partner who was interested more in a long term relationship than a ‘build and run’ approach of web site build. Over the years, we’ve worked with them to develop a new logo, multiple print pieces, HTML email templates, signature files, as well multiple website iterations. The latest website version built in late 2015 combined several sites into one easy content management solution that the team can update using WordPress. The new WordPress site features multiple event galleries, a blog, and an entire online swatch catalog with several selections specifically available for rent through an online e-commerce platform.